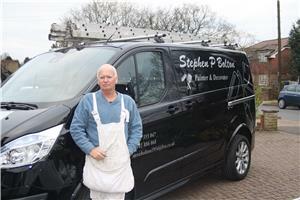 Stephen P Bolton Painting & Decorating - Painter/Decorator based in Hellingly, East Sussex. My name is Steve Bolton and I've been a Painter & Decorator for over 30 years and a member of Checkatrade since 2013. With a City & Guilds qualification, I undertake all work however big or small, covering the domestic and commercial sectors. I am a tidy, a non-smoker and I take pride in all work that I do. Being a sole trader, my prices will always be competitive, please contact for a FREE estimate. I am happy to give advice if needed so call me or send me an email.